There was a time in the 80s when the tale of huge transformable jet-mechas, intertwined with love stories which transcended galaxies, was almost real to some of us. Robotech (for those of us in the western part of the world) or Macross (in its original incarnation from Japan) is a series of science fiction mecha anime that’s rated highly enough to still be in many lists of the top 50 anime series of all time. As a fan of the series, builder Stick Kim takes us back in time by capturing a particular scene where our hero saves the girl while piloting his mech. This fantastic miniature LEGO version of the VF-1S Valkyrie is piloted by Hikaru Ichijyo (Rick Hunter) and cradled in his palms is Lynn MinMay — a beauty who sings, and is his love interest and a key character throughout the series. 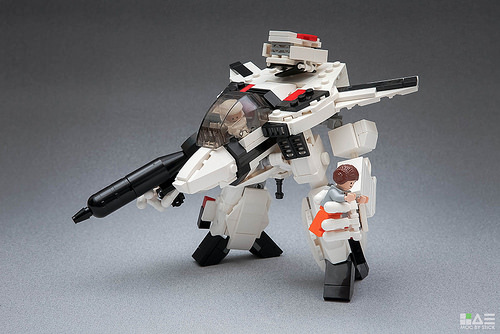 Nice chibi version of Hikaru Ichijoe’s VF-1A Valkyrie from the “Do You Remember Love?” Macross movie!